Global Notes: Apr 6 "Why Did Judaism Survive in Early Modern Germany?" Apr 6 "Why Did Judaism Survive in Early Modern Germany?" 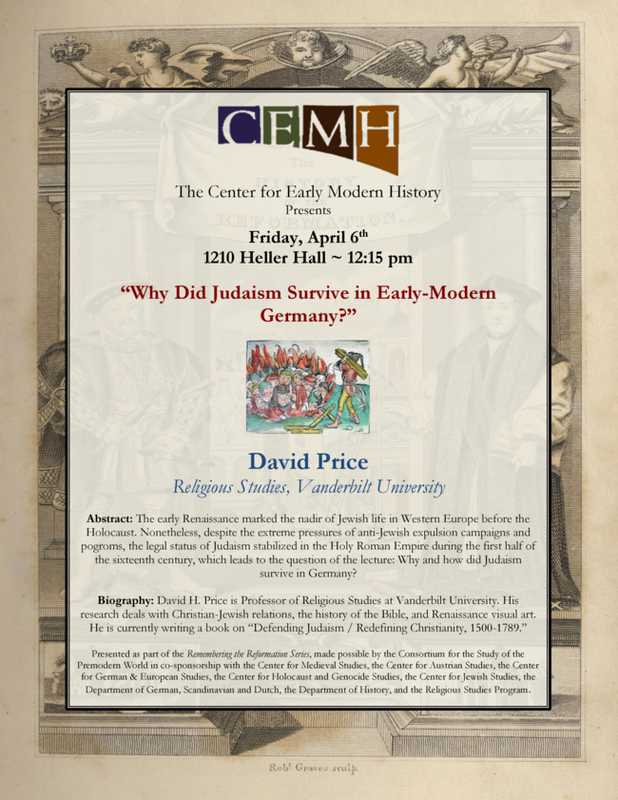 The Center for Early Modern History Presents "Why Did Judaism Survive in Early Modern Germany?" The early Renaissance marked the nadir of Jewish life in Western Europe before the Holocaust. Nonetheless, despite the extreme pressures of anti-Jewish expulsion campaigns and pogroms, the legal status of Judaism stabilized in the Holy Roman Empire during the first half of the sixteenth century, which leads to the question of the lecture: Why and how did Judaism survive in Germany? Presented as part of the Remembering the Reformation Series.